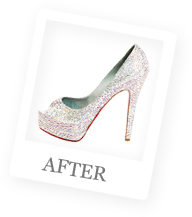 Crystal Heels will redo your shoes using Swarovski crystals creating an awe inspiring pair of custom shoes. 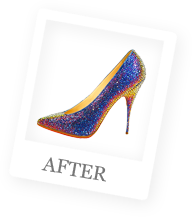 Send us your heels, pick the color crystals you want to use, and we’ll custom “strass” them for you into a one of a kind work of art. 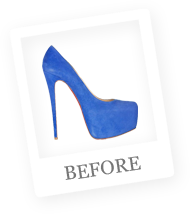 Strassing is the process of applying crystals to your shoes with each stone being hand placed on the shoe one by one. We use an average of 8,000 pieces of Swarovski or Preciosa Crystals to create the perfect pair of custom made crystal shoes. Once you send in your shoes we can get them customized with 100% original Swarovksi or Preciosa Crystals in as little as 2 weeks. We also custom paint each shoe to perfectly match the color crystals you choose and our craftsman will work around the clock to perfectly place thousands of crystals to make your shoe absolutely perfect. 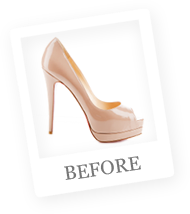 We are perfectionists and take pride in the fact that we are known to create “the world’s most exclusive shoes”. You can even have us create patterns, designs or any color combination that you choose. 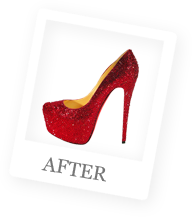 We have created hundreds of custom shoes for our customers which include many celebrities and we will make sure that once your shoes are finished they will be above and beyond your expectations. Whether it’s for weddings, parties or just an extra special pair of shoes you are looking for, our customized crystal shoes will make you shine like a princess and make you feel special as every person you encounter will not be able to take their eyes off your crystal shoes! *All Prices are based on a 4” heel. 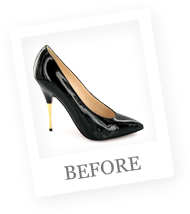 For each additional ½” heel add $70. *Based on a ½” platform. For each additional ½” add $120. *Our policy requires us to ship all shoes insured with signature required.